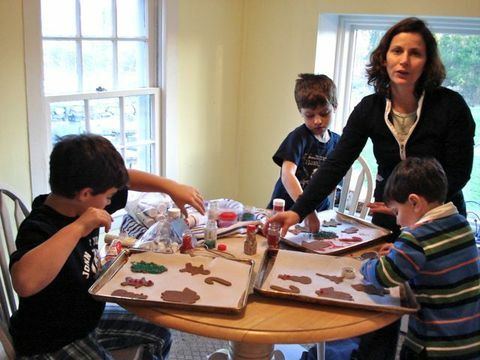 The most fun for the boys is the decorating but the most fun for me is seeing how much they've grown and how much their skills (baking and communicating) have improved over the period of a whole year. Now even the youngest, Max, is able to participate. And of course the best part is also sitting down to a fabulous dinner cooked by Mary Pat and Elizabeth Karmel. Our traditional baking lesson began several years ago when the Wachters still lived in Manhattan so it was just a partial day experience. When they moved to South Salem it required a whole day which very quickly graduated to an overnight stay and then starting last year a two-night stay because we were all having so much fun. Mary Pat let the boys skip school for one day because August, the eldest, reasoned that school is every day but "Rose comes only once a year" (that could change with the addition of a summer visit!) Mary Pat is a very wise mother. After all, what could be a better lesson than baking: math, science, art, manual dexterity, focus and attention span all rolled into one! 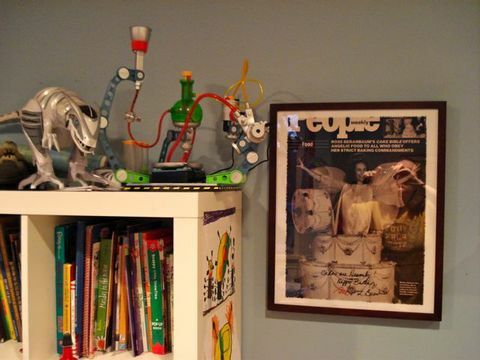 This year Mary Pat put up the photo I gave the boys in their playroom so that they could remember me and our baking tradition over the year. Dinner the first night included fantastic burgers I had requested after hearing about how great they were last year. 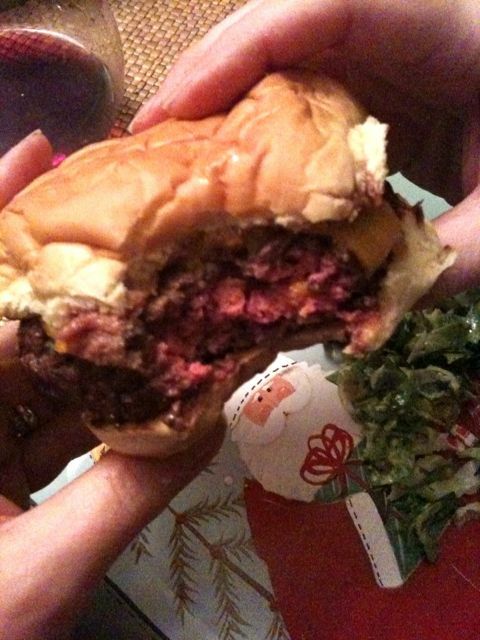 MP has her butcher grind hanger steak and the resulting beef is juicy and incredibly flavorful. Grilling goddess Elizabeth stood outside in the freezing cold to grill them to perfection. 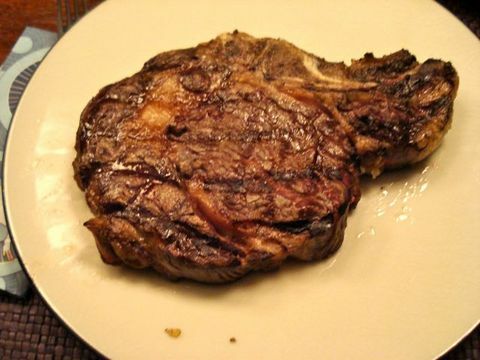 It was so deliciously beefy I didn't even add ketchup! Breakfast the next day included my favorite sausages from North Carolina, shipped up by Lynn Karmel (their Mom) and the very best biscuits made by Mary Pat who surely woke up extra early to make them fresh for our breakfast. Thus fueled we started our baking class. 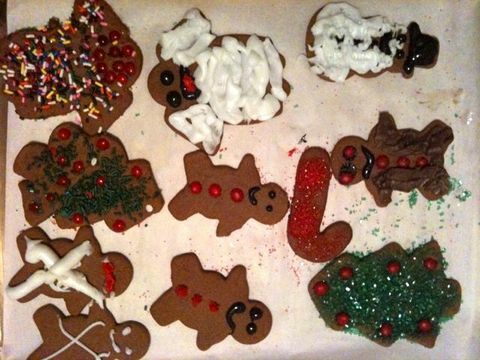 First came the gingerbread dough to give it a chance to firm in the frig. Then the ganache for the cake as that too takes a while to firm up for frosting. I chose the Chocolate Tomato Cake with Mystery Ganache from the new book because I thought it would be a great lesson teaching the boys that tomato is a fruit and also how to pipe buttercream flames on top of the pirouette cookies. Unbeknownst to me, that was Alexander's choice as well. 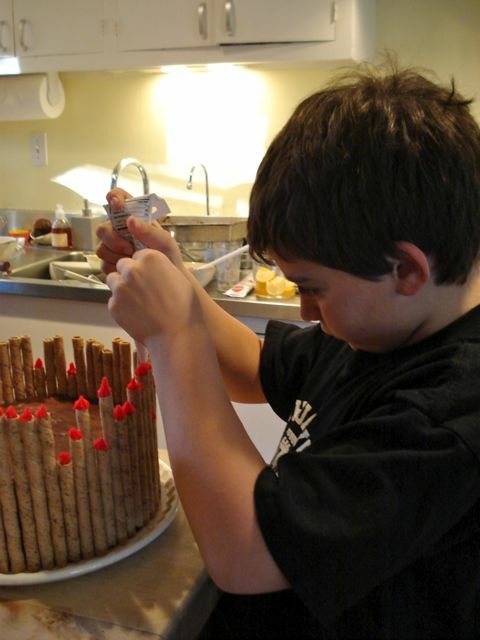 August, now 8, was more helpful than ever weighing ingredients and he got really good at piping the flames. Middle brother Alexander also took great pride in the cake! Lunch break was a delicious selection of sandwiches, my cranberry walnut loaf, and a luscious salad of stone crab and grapefruit. The stone crab was a present to Elizabeth from Lee Brian Schrager (who runs the Miami and NY Food and Wine Festivals). Here are all three boys happily decorating their cookies with MP's guidance. Alexander, ever the artist, was really in his element! 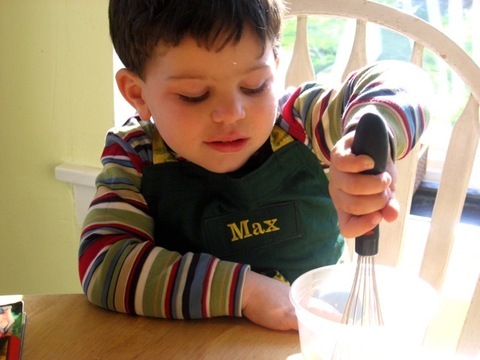 Baby brother Max is the youngest of the whiskers and right at home with the utensil! 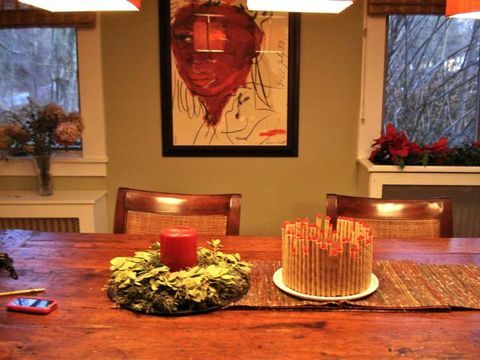 The completed cake became the center piece of the holiday table until we cut into it for dessert. 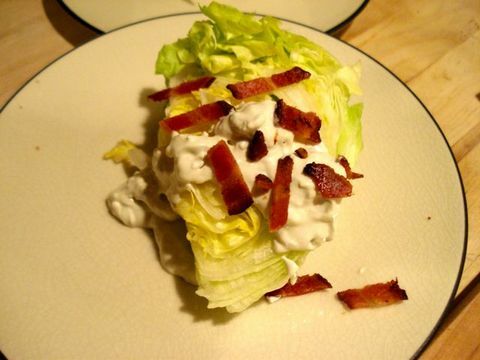 Dinner was a salad of iceberg lettuce topped with a terrific blue cheese dressing adapted from a dip recipe in Elizabeth's cookbook Taming the Flame. And an excellent, perfectly grilled rib eye steak, accompanied by intensely beety roasted beets for our main course. Everyone enjoyed the cake and remarked on how they never would have guessed the mystery ingredient either in the cake or in the ganache (Campbell's tomato soup)! August has already put in his request for next Xmas. The Double Chocolate Whammy Groom's Cake baked in the stadium pan. I assured him that he didn't have to get married to get me to do that cake with him!